A Set of 4 x 35mm chromed bolts with matching shakeproof nuts. 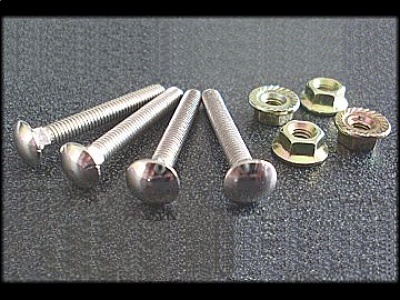 These are ‘mushroom’ headed bolts that are perfect for mounting joysticks into any type of panel. Just drill a 5mm hole and you’re done. They have a very low profile head and a square shank and unlike any other bolts available in Australia they have NO BRANDING on the head! The bolts are lightly chromed so they won’t tarnish	however if you prefer the “worn out” or anodized look it’s easy enough to sand them and spray on a couple of coats of coloured paint.